The rotator cuff muscles are the supraspinatus, infraspinatus, subscapularis, and teres minor. Repetitive microtrauma and anatomic variations lead to most rotator cuff injuries. Such injuries are commonly encountered in athletic and nonathletic patients. See the image below. The goals of treatment for rotator cuff injuries are to reduce inflammation, relieve stress on the rotator cuff, and correct any biomechanical dysfunction. If NSAIDs alone do not provide adequate pain relief, consider adding acetaminophen to the treatment regimen. Other analgesics such as ibuprofen and ketoprofen may also be used in the management of rotator cuff injuries. Emergent orthopedic evaluation is warranted in acute injuries or even severe extension of chronic rotator cuff injuries, because they have a poor prognosis with conservative modalities. 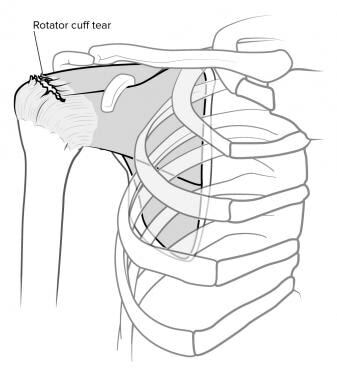 Rotator cuff injuries are problems commonly encountered in athletic and nonathletic patients. Symptoms include pain, weakness, and decreased range of motion. Early diagnosis is important for identifying causes, implementing effective treatment, and preventing further injury. 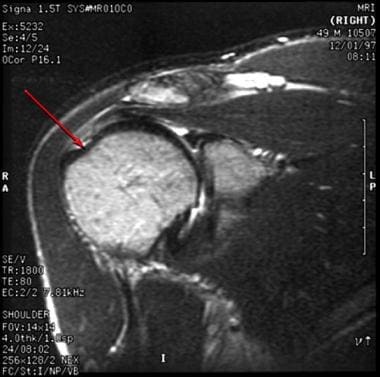 A rotator cuff injury is shown in the image below. Knowledge of the mechanical and normal anatomical structure allows for understanding of rotator cuff injuries (see Rotator Cuff Pathology). The rotator cuff muscles are the supraspinatus, infraspinatus, subscapularis, and teres minor. 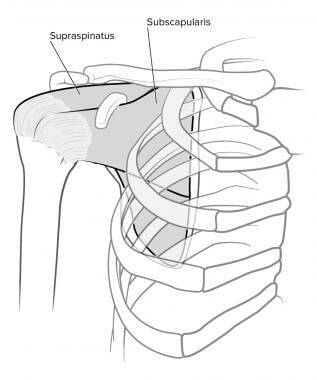 The subscapularis is a humeral head depressor and, in certain positions, an internal rotator. The infraspinatus and teres minor are external rotators. These muscles work as a unit, rather than individually, to maintain the dynamic glenohumeral stability. All are innervated by subscapular and axillary nerves. The vascular supply largely is dependent on the anterior humeral circumflex artery, which supplies the anterior cuff, and the posterior humeral circumflex and suprahumeral, which supply the posterior cuff. Microscopically, all of the tendons of the rotator cuff fuse to form one continuous band, which is composed of a 5-layer structure. Because of this structure, none of the individual muscles have a higher incidence of tear, per se. However, the joint-side portion of the supraspinatus tendon is more susceptible to mechanical failure than the bursal side. Most of the tears of the cuff are the result of chronic degeneration, which makes them susceptible to rupture. The chronic deterioration of the cuff results from the coracoacromial arch, which is composed of the bony acromion, the coracoacromial ligament, and coracoid process. Because of its position above the rotator cuff, the coracoacromial arch forms the roof through which the supraspinatus tendon must pass (ie, supraspinatus outlet). Repetitive microtrauma and anatomical variations lead to most of the rotator cuff injuries. Tendon degeneration is classified in 3 stages (classification of the impingement syndrome) based on the supraspinatus outlet. Younger patients are more likely to have rotator cuff dysfunction because of overuse, subtle instability, and muscle imbalance. Older patients tend to have chronic shoulder pain and degeneration.